Blake Windred fired a final round 6-under 65 to finish in a three-way tie for second at the Porter Cup in New York Sate to record his best US tournament result so far this tour. 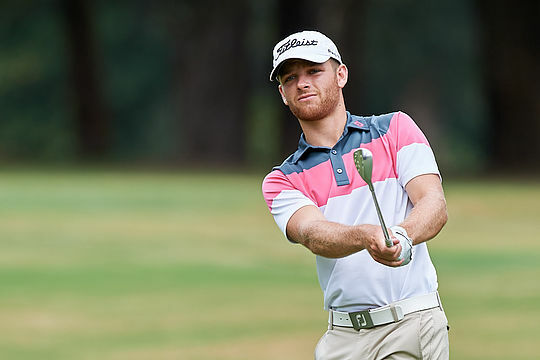 Windred, a winner earlier this year in Australia at the Avondale Medal, fired rounds of 67-71-69-65 to finish at 8-under-par, three strokes behind eventual winner American Thomas Walsh. Windred shared the runner-up finish with Americans Tyler Strafaci and Den Schlottman. “I was happy to climb the leaderboard and get into contention on the back nine today. I managed my game well this week. It was a lot of fun, and I’m very happy with the second place finish,” said the 21-year-old. The results adds to Windred’s’ top-20 finish at the Players Amateur last week and his tied 7th result at the European Amateur. Last year he finished in a tie for 4th to secure Low Amateur honours at the NSW Open Championship, a professional event on the Australasian PGA Tour. Shae Wools-Cobb was the next best Australian finishing at 5-under-par to record a top-10 result in 6th place. Wools-Cobb fired rounds of 70-65-69 with a final round 71 see him slip four places after starting the round in a tie for second position. Fellow Queenslander Charlie Dann rounded out the Australians in the top-10 finishings at 4-under-par. Justin Warren carded a final round 70 to finish in a tie for 15th at 1-under-par. Australians have enjoyed considerable success recently at the Porter Cup with Harrison Endycott winning in 2016 and Geoff Drakeford claiming the title in 2014. Past champions include David Duval (1992), Phil Mickelson (1990), Scott Verplank (1983) and Ben Crenshaw (1972). For those Australians fortunate to either be invited or who are exempt, the Western Amateur is next on the tournament calendar starting 30th July at Sunset Ridge Country Club, Northfield, Illinois.